Home /DTH/Comparing Tata Sky and Airtel DTH Services! The direct-to-home facility is one of the most powerful industries in India and by offering competitive, simple to use and high-quality interactive services it is making a big impact on our lives. For an amazing and complete TV experience, DTH is a must, but it’s not an easy job to choose the one amongst the variety of options available. 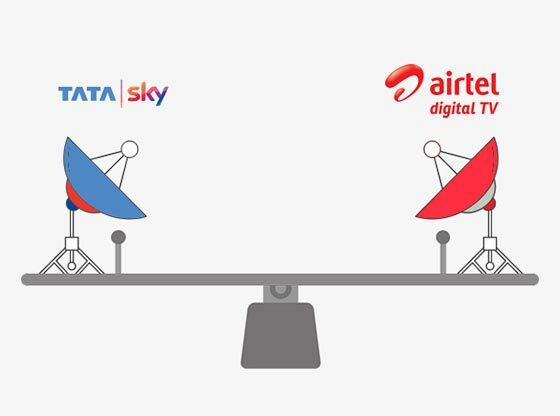 In this blog, we are going to help you in choosing the DTH service as per your needs, by comparing the various features and even DTH Recharge packages offered by Airtel and Tatasky. They both are the top players in the DTH market and this makes people even more confused about which one is the best. Although quality is almost similar in both, prices vary a lot. So, choose your DTH Recharge plan smartly, and do consider if the DTH operator is offering you value in return of your money or not. Airtel Digital TV Recharge has 4 online DTH Recharge packs that include Value Prime for Rs. 240 that offers 125 channels, Economy Sports Plus for Rs. 340 that offers 155 channels, Mega Plan for Rs. 410 that offers 175 channels and Ultra plan for Rs. 470 that offers 181 channels. If we talk about Tata sky Recharge plans, then they are a bit cheaper than Airtel, as you can get 124 channels for Rs. 99 under the plan My 99, Dhoom plan offers 147 channels at Rs. 179, Metro plan provides 158 channels for Rs. 380 and Grand Sports plan offers 180 channels for Rs. 470. After reading the comparisons mentioned above, most of the things about Tatasky DTH and Airtel Digital TV must be cleared in your mind now. If you still want to know more about the plans and DTH recharge offers, then you can visit TalkCharge. Apart from TataSky DTH and Airtel Digital TV, there are other DTH operators too, like Dish TV, Reliance Big TV and more. You can find your best option amongst them if you don’t feel like going for Tatasky or Airtel. At TalkCharge, you can check out various DTH recharge packs belonging to different operators and make a wise choice accordingly. Now, the only thing that is left after picking a DTH operator is where to do the monthly DTH recharges. I would suggest TalkCharge, not because I love it, but because it provides amazing cashback offers, like 150% OFF, 500% OFF and even Flat Rs. 20 cash back on your first recharge. So, you would get to enjoy not only hassle-free recharge services online, but you will be getting rewarded for making an online payment. This isn’t an opportunity to miss; for more details, you can check out the Offers page at www.talkcharge.com.